As the world marks the centenary of the end of World War I, we turn our thoughts to Goans who fought in it. My thanks to Cliff Pereira for this extensive piece of research, which will soon be updated, and is a fitting piece of history for the occasion. Source acknowledgements have been deleted due to a glitch however I have a PDF with the info. Independent Historical Researcher, Curator, Museum Consultant and lecturer. Pereira holds a BA(Hons) in Geography with Asian Studies. As fellow of the Royal Geographical Society (with IBG) he turned to research in 2001 on a variety of themes leading to an exhibition on the Bombay Africans (2007). Pereira was Visiting Research Assistant to Dalian Maritime University, China (2011-2015). He was Researcher-Curator on the Bait-Jelmood Museum, Qatar (2013-2016) and for the National Museum of Qatar (2016-2018). Pereira was awarded Honorary Research Associate of the University of Hong Kong in July 2018. Pereira describes himself as a historical geographer. He has numerous papers and chapters in publications around the world. Goa is a small Indian state on the West coast of India, dissected by many rivers and creeks and backed by the Western Ghats. The Konkani-speaking people of this area have a rich maritime heritage and were long part of the Indian Ocean trading networks. Since 1510 Goa had been under Portuguese rule, but from the seventeenth century Portuguese imperial influence shifted from Asia to Brazil. In the same period the Dutch, British and French stepped their economic presence through trading companies and eventually by the eighteenth century the Western coast of India was under the sway of the British through the East India Company. The Bombay Presidency drew heavily on both uneducated and educated Goans and in the late nineteenth century Bombay was the point of economic development of British colonial rule in East Africa. Indentured South Asian immigration had greatly benefited British rule in the Caribbean, Fiji, Malaysia, South Africa and East Africa where they built the first railway line connecting Lake Victoria with the coast. Free immigration of people mainly from the Punjab, Gujarat followed. Christian Goans as Portuguese subjects were encouraged to work in the African colonies as they were, educated in the Latin script, where Christians and since they were not British subjects, they was no pressure for the British to care for their needs. At the onset of the First World War East Africa was a mosaic of European colonies and Protectorates. To the north were French Somaliland, the British Protectorate of Somaliland, and Italian Somaliland. British East Africa, the Coast Protectorate and the British Protectorate of Uganda were at the centre and to the South were German East Africa (Tanganyika) and Portuguese East Africa (Mozambique). Two states remained as independent entities, Abyssinia and the Sultanate of Zanzibar. Archival sources and oral history suggests that there were Goans in all of these diverse territories. The German and British railways, inland shipping, postal; telegraph, banking and government administrative developments brought hundreds of Goan men to East Africa where by 1911, their wives and families had begun to join them in the cities of the coast, notably in Zanzibar, Mombasa, Tanga and Dar-es-Salaam, and all along the railway lines from the coast to the Great Lakes, where new cities such as Kampala, Entebbe, Kisumu, Nakuru, Nairobi, Arusha and Moshi were developing. In Uganda G. Lyall thought the employment of Goans was too expensive and favoured the use of Africans. His views were taken up by Governor Jackson who appointed a committee in 1913 to look at replacing the Goans with Africans, but the government in London and the outbreak of war prevented any action. At the same time dissatisfaction with British rule was beginning to be felt in many parts of the “empire on which the sun never sets” including Ireland which had been one of the traditional sources of soldiers to police the empire. On the other side of the world, at Astoria, Oregon, USA another movement was taking shape. On the 30th May 1913 the local paper, the Astoria Budget printed a notice that the Hindu Association of Astoria, under the Secretary Munshi Ram would be inviting the Stanford professor and Indian revolutionary Har Dyal (1884-1939), to deliver a lecture at the Astoria Finnish Socialist Hall. This speech marked the founding of the Ghadar Party, and is considered one of the most important steps towards ending British rule in South Asia. Har Dyal found an attentive and sympathetic audience among the mainly Punjabi farm and mill workers. By the end of the year South Asian labourers from Oregon to British Columbia, Canada had become politically aware and were led by Sohan Singh Bhakna from Portland. The movement spread quickly to San Francisco, Singapore, Hong Kong and East Africa. But the base of the movement remained with the Punjabis, and specifically with Sikhs. Goans had initially come to East Africa through agents Bombay, which held political and economic sway as manifested by the use of the Rupee over Arabia and the entire coast of East Africa. The same process also led to the volunteer of Goans for service in the Royal Navy as attested by the 1911 British Census return that featured six Goans on board the HMS Alert, a British training vessel.These men were enrolled on the “Principle Conditions of Non-Continuous Service”. Goans who were destined to be stewards and cooks were often engaged as boys or young men and had to be “trained at depot ships before serving commissions afloat” under the enrolment terms. They also had to “agree to serve for five years from the date of entry”, though this could allow for a break and would often allow for a change of vessels5. Goans on the HMS Alert 1911. Source: UK 1911 Census. The National Archives. The impending war was chronicled in East African newspapers and the British Royal Navy and German Navy were poised for possible conflict. As Portuguese citizens Goans may have initially considered themselves safe, since Portugal was neutral at the start of hostilities. However, Goans were far too involved in the running of these colonial possessions to declare them as mere observers and in any case the war was to bring irreversible change in attitudes against Europeans and Asians from Africans. In April 1913 in anticipation of war the British Royal Navy vessel HMS Astraea was ordered from South Africa to East Africa to watch the German cruiser SMS Konigsberg. At the beginning of hostilities in Europe on the 28 July 1914, both vessels were at Zanzibar Harbour. Up to this point the war was limited to the Balkans, but on the 31st July 1914, amid a monsoon squall the SMS Konisgberg cleared Zanzibar harbour in pursuit by the slower HMS Astraea, HMS Hyacinth and HMS Pegasus. Family history among the Goan community has identified Goan cooks on British vessels such as such as Deogo Antonio Pereira from Tivim who was the officers cook on the HMS Astraea. On the 5th August 1914, Britain, France and Russia declared war on Germany and on the 8th August the HMS Astraea bombarded the German wireless station at Dar-es-Salaam, making this the first naval engagement by the allies in the war. Taking matters into their own hands the Captain of the Astraea signed a truce with the German governor at Dar-es-Salaam. The HMS Astraea then sailed off to attack the Germans at Duala in German West Africa (Kameroons). Ironically there were Goans such as Mr. Mendes from Candolim working at the wireless station which was actually run by the Eastern Telegraph Company. For Goans up-country in Kenya and Uganda the railway was a lifeline to the outside world and connections to Goa. More importantly, for many Goans such as railway clerk J.F Fernandes at Voi was the German Commander General Paul Emil von Lettow-Vorbeck who ran a campaign from Tanganyika attacking the Uganda Railway line at nearby Taveta on the 15th August 1914. From a base at Mbuyuni, the Germans ran a campaign against the railway for over a year, by derailing trains and blowing-up bridges. Clement J Charwood, a Second Officer of the SS Pentakota of the British Steam Navigation Company (BISNC) sailed into Mombasa’s Kilindini Harbour and was surprised to witness a flotilla of dhows flying American flags. This was the flotilla bringing Belgian, British and French refugees from German East Africa. There are references to the evacuation of European women and children from British East Africa, but few references to Asian evacuations. However, family history studies suggests that some Goans who were coming to the end of their government contracts in Uganda did return to Goa around this time and did not come back to East Africa during the war years, choosing instead to construct their large houses in Goa with the remittances from East Africa. Before the War there were an estimated 600 to 700 Goans in German Tanganyika, There was a Goan community in Dar-es- Salaam and in Tanga. Very little is known about the Goans who were in German East Africa during the war. We know that one Clement DeSouza held a farm at the sight of the present day Tanga Airport, and was an honorary member of the German Club in Tanga. Hundreds of Goans worked on board ships of the British Merchant Navy and on the 22nd August the first troop convoy left Bombay for Alexandria composed of six British ships of the BISNC. In fact during the war ships of the BISNC and the P&O made up 90% of the British convoys. Their Goan crew (as stewards and cooks) therefore provided a crucial role during the war. But evidence from Canada and the USA suggests that there was open discrimination against Goan merchant seamen, whose Portuguese nationality did little to protect them against anti-Asian discriminatory laws. There is evidence of Goans arriving at Vancouver, Canada on the SS Carnarvonshire (III), a Royal Mail Steam Packet of the Shire Line from Antwerp via China and Japan. The Asian crew was not allowed on shore and the ship sailed on to Seattle. “The Alien Crew List” completed in Seattle states that the vessel arrived from “Vancouver BC” and that the SS Carnarvonshire (III) carried 62 “British Indians”, 11 “Portuguese” and 22 Britons. The British Indians included a fireman and coal trimmer taken on at Singapore. The “Portuguese” were in fact “pantry men”, cooks and saloon boys from Goa. Similar anti-Asian laws were in place in the USA and in the most successful colonies of the British Empire including Australia and South Africa. The South Asians of Kenya (usually termed Indians as they hailed from British India) were perceived by many British colonists as being unsupportive of the war effort. Ewart Grogan, sometimes called the “Kenya’s Churchill” was one of the leading opponents to Asian immigration. At a rally attended by 1500 people held at Nairobi’s Theatre Royal on 7th September 1914, Grogan praised the forces and colonists from Australia, New Zealand, Canada and South Africa, but did not acknowledge those from India, or the various African regiments. When the meeting was open to the audience Mr. Narayandass expressed the support of the local Indian community. He was followed by Mr. J.M. Campos on behalf of the Goan community who received a greater cheer from the mainly settler crowd14. It is not clear if Ewart Grogan knew about the Ghadar movement, but he would certainly have known about the Komagata Maru incident at Vancouver in May 1914. The Germans in Tanganyika went attacked the town of Kisii in Western Kenya on the 10th September 1914 and were expelled from Kisii by a force of Kings African Rifles that landed at Kendu Bay on the shore of Lake Victoria and marched on the town forcing the Germans out and taking their four machine guns and ammunition. In the confusion of war several Jaluo and Abagusii men found an opportunity to attack the shop of Mrs Mascarenhas at Raina which was completely emptied. The SMS Konisgberg meanwhile was attacking Allied shipping in the Indian Ocean and returned to Zanzibar to launch an attack on the HMS Pegasus and another ship on 19th September 1914. Both ships were sunk, but the guns of the HMS Pegasus were salvaged and reused during the war. Twenty-four British seamen and one African were killed in the attack. Thirty-two wounded were transferred to South Africa on board the SS Gascon. On the 16th October 1914 a convoy of forty-five ships left Bombay harbour, including fourteen troop transports carrying 8000 troops. Many of these ships such as the P&O ship SS Karmala had Goan crewmen. The Indian troops were poorly trained and many from the Punjab and Sind had never been on a ship before. The food on board the ships from India was unfamiliar and most suffered from sea-sickness. Secrecy was unknown and the news of the flotilla was covered in East African and British papers. On Zanzibar Island a British Anglican deacon was riding the 5miles of railway into Zanzibar Town as the only passenger on this railway. He struck up a conversation with the “Goanese guard”, whereby the guard told the deacon that the British had landed at Dar-es-Salaam and would be blown up by the many mines there. Where the guard had heard the story is unclear, but the deacon rushed to the bishop of Zanzibar and the British authorities, who denied the story and summoned the Goan guard who was arrested and taken to court. As a Portuguese subject he was defended by the Portuguese Consul. The outcome was that the guard was found guilty and fined; though in a curious twist the deacon paid the fine. A Volunteer Carrier Corps was established in Zanzibar by Bishop Frank, and they often paraded on the waterfront headed by a Goan band as a morale boast . On the 31st October the troops arrived in Mombasa19. Less than a week later British and Indian troops set off from Mombasa to attack the well informed and trained Germans resulting in the defeat of the British at the Battle of Tanga 3-5th November 1914. British casualties were 795, including 141 British Officers there was fear of a German attack on Mombasa itself which prompted the evacuation of European women and children. At the port of Kisumu on Lake Victoria a young Caetano João Pedro Rodrigues who arrived from Betalbatim, Salcete in 1915 was working for the Menezes store. He went to work on the lake steamer the SS William Mackinnon which was hurriedly armed with a rather useless saluting gun for use against the Germans who had controlled the lake with their well-armed Muansa. The German ship was scuttled by the British ships SS Winifred and SS Kavirondo in 1915. One of the salvaged guns from the HMS Pegasus that sunk in Zanzibar was railed from Mombasa to Kisumu and mounted on the SS Winifred of the Uganda Railway Marine and this was a decisive factor in retaking Lake Victoria from the Germans. With a World War in full force the British government began to see the Ghadar movement as a major threat to the war effort, its aspirations for a free India, could be supported by Germany and Turkey, and a major rebellion in India at this time would have spelled disaster for the allies. British and Indian troops in India had been sent to Flanders, leaving a minimum of British officers and their Indian troops to maintain British military power in India. The Ghadar movement was already established in Kenya by Gopal Singh and was under the leadership of Sitaram Acharia. To make matters worse, the British colony of Kenya and the Uganda Protectorate were on the frontline of attacks from German Tanganyika and there were voices of dissension among many African groups. The defence of the Uganda Railway and the settler farms and plantations of the Kenya Highlands was based on African and Indian troops. 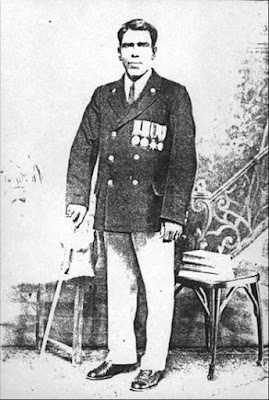 Sitaram Acharia was arrested and deported to the Punjab in 1915. In December 1915 three Ghadar activists were sentenced to death in Mombasa. In the trial in Lahore the tribunal sentenced 24 men to death, although only six had been convicted of capital offences. The viceroy commuted the sentences of eighteen26. The HMS Astraea returned to East Africa and was one of the ships involved in the scuttling of the SMS Konigsberg in the Rufiji Delta July 1915. She then supported the introduction of Indian troops to fight the Germans in Tanganyika. By this time Deogo Pereira joined other Goans including C.R. D’Souza on board the HMS Hyacinth which was also involved in the campaign against the SMS Konigsberg27. In fact the Germans scavenged the guns from the SMS Konigsberg and mounted them on wheels made from the ships’ funnels and used them in their overland campaign. The lack of manpower for the war effort led to the some forced conscription especially among the Girama tribe in Kenya, who were already in revolt over enforced expulsion from their lands. The recently qualified Dr. Antonines Caetano Lactancio De Sousa from Bombay was sent to serve near Malindi in the Giriama area in 191628. Another Goan, Mr. P.A. Rozario was attached to the 5th Kings African Rifles as a clerk based at Kismayo (then part of the Jubaland Province). Some Goan fatalities in British Merchant Shipping WWI. Source: Commonwealth War Graves Commission. German raiders attacked shipping and laid mines across the globe and many Goans working in the British Merchant Navy were recorded among the casualties. The Inland Water Transport Corps, who were part of the Royal Engineers, were essential in the war in East Africa as the many lakes and rivers were often the best corridors away from the railway lines to move troops. Detachments were established at Kilindini (Mombasa), and Port Amelia in Mozambique. As the war came to an end in East Africa and the British took the ports of Lindi and Dar-es-Salaam. The Corps established themselves at these former German ports. Tally Clerk J. Rodrigues was a Goan with the Inland Water Transport and was recorded as dying on the 27th October 1918. He was buried at Dar-es-Salaam War Cemetery. At the Nairobi South Cemetery is the grave of J.A. Ribeyro a conductor and member of the East African Transport Corps who died on 22nd April 191831. Out of an adult male Indian population of just over 12,000 in the Kenya colony, only 227 Indians had volunteered to fight and only 45 were briefly conscripted into the East Africa Mechanical Corps. Goans at this time were considered as a separate “non-British Indian” community, and though we don’t have precise statistics, the evidence from fatalities suggests that Goans played a role far out of proportion to their total numbers which were probably not more than 2000 in the Kenya colony during the war. By the end of the First World War over a hundred and fifty Goans had been granted medals by the Royal Navy33 and the Goans certainly achieved the admiration of East African anti-Asian colonists such as Ewart Grogon34. Most Goans who were Portuguese subjects in the Royal Navy had actually signed on well before the start of hostilities, their involvement in the war could be regarded as Portuguese action, even though it occurred prior to March 1916 when Portugal joined the Entente Powers. Analysis of British records suggests that the bulk of the Goans in the Royal Navy were employed as cooks and stewards, however there were also bandsmen, one group of which received their General Service medals in 1915 at Port Said in Egypt on board the HMS Swiftsure. This battleship was the flagship of the East Indies station, and employed more Goans than any other British vessel. Originally the ship escorted troop convoys from Australia, New Zealand and India to Aden. After defending the Suez Canal from Turkish attack in 1915 the HMS Swiftsure went on to the famous Gallipoli Campaign. Goans were employed mainly in the East Indies Fleet during the First World War and the granting of medals in 1915 at Port Said, marked the transfer of the ship to the Atlantic Fleet36, and therefore the Goans were transferred at Port Said from the HMS Swiftsure onto other vessels. In many ways this procedure epitomises the position of Goans within the British Empire at the time. They were considered important, if not crucial to the smooth running of the empire, but as Asians they were excluded from certain spheres. This could be the waters of the North Atlantic, or ownership of lands in the Kenya Highlands, or in fact in certain areas of cities such as Nairobi, and definitely in certain Imperial bastions such as the Norfolk Hotel where the only non-white faces were the Goan barmen. In Uganda before the war had ended the Africans had started to lobby for equality with Asians in the civil service37. In 1913 the last of the Sikh soldiers had been replaced by Nubians and other Africans38. Even in 1917, the number of South Asians in Uganda was only 3548 of which 80% were men. In Nairobi the war years were marked by a new political awakening among the Goan community with the appointment of Dr. Ribeiro as Portuguese Vice Consul between 1914 and 1922. Goan resentment at their treatment within the civil service led to the founding of the Non-European Subordinate Civil Service Association in 1919. This organisation would evolve into the Kenya Asian Civil Service Association in 1921 and become a formidable voice in Kenya politics. The First World War had exposed the inability of Europeans to hold on to empire and the vulnerability of European empires in the face of numerical strength of subject peoples throughout the Caribbean, Africa and Asia. Like other servicemen, Goans had experienced the atrocities on Africans and Asians committed in a war caused essentially by European powers. They had also been made more aware of the limitations placed on them in terms of wages and other advantages, including the right to opportunities. At the same time new opportunities to better their lives by further emigration from Goa to East Africa opened, especially with the creation of the Tanganyika mandated territory. The seeds to ending the age of empire had been sown and British schemes to settle ex-servicemen in the Kenya Highlands, would only increase African and Asian dissatisfaction. Bexley Family and Local History Centre. London. England. UK. British Library. Euston. London. England. UK. Clatsop County Historical Society. Astoria, Oregon, USA. Commonwealth War Graves Commission. Maidenhead. England. UK. Imperial War Museum. London. England. UK. Marconi Museum. Cornwall. England. UK. Ministry of Defence. London. England. UK. National Maritime Museum. London. England. UK. Royal Geographical Society (with IBG). London. England. UK. SOAS Library. University of London. London. England. UK. The National Archives. Kew. London. England. UK. The Wallace B. Chung and Madeline H Chung Collection at the University of British Columbia. Vancouver, British Columbia. Canada. Vancouver Maritime Museum. Vancouver. British Columbia. Canada. Mr. Anthony De Souza. Canberra. Australia. 2007. Dr. John De Souza. Nairobi. Kenya. 1999. Mr. Mervyn Maciel. London. UK. 2003. Mr. Ivan Pereira. Ottawa. Canada. 2010. Mr. Ferdinand Rodrigues. London. UK. 2012. Supplement to the Official Gazette of the East African Protectorate, March 28th 1917. UK Census 1911. Ghadar, Historical Silences, and Notions of Belonging: Early 1900’s Punjabis of the Columbia River. By Johanna Ogden. In Oregon Historical Quarterly Volume 113. No.2. Portland, Oregon, USA. 2012. Life of a Goan Seaman. By Clifford Pereira BASA newsletter 29. London. September 2000. The Surveillance of Indian Nationalists in North America, 1908-1918. By Hugh Johnston. In BC Studies/ Number 78. Vancouver. British Columbia. Canada. Summer 1988. Frank –Bishop of Zanzibar. By H. Maynard Smith. London. 1926. Never Be Silent: Publishing and Independence in Kenya 1884-1963. By Shiraz Durrani. London. England. UK. 2006. History of the Corps of the Royal Engineers. Vol V.
Koningsberg: A German East African Raider. By Kevin Pqtience. Bahrain. 2001. Merchant Fleets: British India S.N. Co. Duncan Haws. Burwash. 1988. The Great War in Africa (1914-1918). By Byron Farwell. London. 1987. The Nubians. By Dennis Pain. In Expulsion of a Minority: Essays on Ugandan Asians, Edited by Michal Twaddle. London. 1975. The Uganda Civil Service. By Nizar Motani in Expulsion of a Minority: Essays on Ugandan Asians, Edited by Michal Twaddle. London. 1975.